We spend a lot of our time at FanGraphs focusing on players who have bright futures ahead of them — or campaigning to have a blocked player finally get a chance in the major leagues. This makes sense, since it’s human nature to look for the positives and see the future with optimism. Unfortunately, life doesn’t always turn out that way for ballplayers. Many of them flame out at a young age. Are we witnessing the same fate for Toronto Blue Jays starter Brett Cecil? Following his disastrous 2011 — during which he spent a stint in the minors — Cecil reported to camp this year having shed more than 30 pounds, but his velocity was down in the 87-89 mph range. In his latest start, he allowed five walks in only 2.2 innings, and he gave up five runs. While it’s true that it’s only Spring Training, this isn’t good news for a pitcher who has experienced velocity issues in the past, and was once was counted on to be a reliable middle of the rotation starter. Let’s take a look at Cecil’s development, and how it compares to where he is in 2012. While not overly regarded as a prospect, the former sandwich pick out of the University of Maryland did clock in at No. 3 on the Baseball America’s 2009 list of top Blue Jays prospects – though it was a rather thin crop. Cecil was called up that year to make his first career start on May 5, and he finished the year with 93.1 IP and a 5.37 FIP. The high FIP can be attributed to his allowing 1.64 home runs per 9 innings. Despite the high homer rate, expectations remained high for Cecil, and he made his 2010 debut on April 23. This time, he got his home run problem under control and posted 2.6 WAR on the strength of a 4.03 FIP. One of the big reasons for the improvement was doubling his change-up use to 23.8% at the expense of his below-average fastball. Still, if we look closely at his game log and his velocity charts, we see a disturbing trend. In five September starts that season, Cecil allowed 20 earned runs in 26 innings to go along with a 12:9 strikeout-to-walk ratio. When looking at his velocity chart, it’s apparent that his velocity began to lag two-thirds of the way through the season. And it really fell off in September, as he averaged 90 mph on his fastball in just one of those starts. Unfortunately, these results continued in his third year, too. Cecil was demoted to AAA after four starts. He’d posted a 6.86 ERA and failed to average 90 mph on his fastball in any game. After returning to the big-league rotation on June 30, Cecil combatted his reduced velocity with an increased reliance on his change-up — which went up to 32.7%. But it was too much of a good thing, and his wCH/C fell from 0.46 to -0.30. By September, his average fastball velocity was down to 86-88 mph, compared to 90-92 mph in his rookie season. Of course, velocity isn’t everything, especially for a guy like Cecil. Lots of soft-tossers have been successful by using command and devastating change-ups. Unfortunately, Cecil doesn’t appear to have much of either. He has a career BB/9 of 3.09, compared to a SP league average of 3.03, and his change-up has been -0.2 runs below average. These factors, combined with a slightly below-average ground-ball rate, do not paint a pretty picture. The club is reportedly happy with his weight loss and the look of his change-up in Spring Training, though the lack of velocity is still disconcerting. 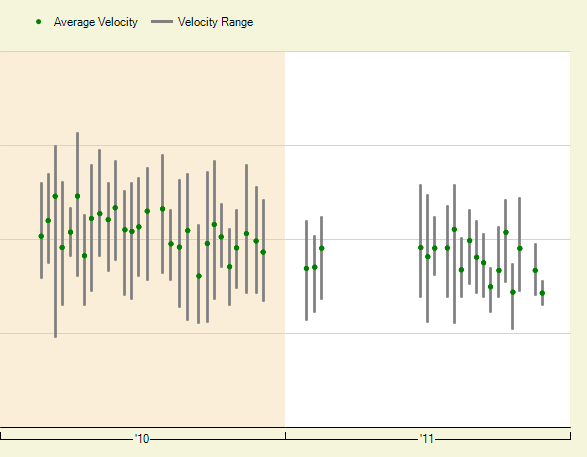 Correlation does not necessarily mean causation, but Cecil’s 2011 performance was fairly in-step with his velocity. His results were at their best in July when his velocity was pushing 90 mph. And he struggled, mostly with the long ball, in April and September, when his velocity was down. With Ricky Romero, Brandon Morrow and Henderson Alvarez penciled into the rotation — and Dustin McGowan, Jesse Litsch, Luis Perez, Carlos Villanueva and Kyle Drabek all having varying ability to start — Cecil’s leash won’t be long this year. While we don’t want to infer too much, it is difficult to imagine that the recent McGowan extension is good news for Cecil. With the addition of a second wild card playoff spot, there’s a strong possibility that the Jays will be contending within the next couple of years. And if Cecil isn’t going to contribute, the club might be looking to find pitcher’s who will. We hoped you liked reading Brett Cecil’s Descent? by Ryan Campbell! Cecil is certainly a guy who won’t end the year in the Jays rotation, let alone make it through April there. He is a lock to begin the year in the rotation in the number 2 spot, slated to face Boston on Tuesday April 10th… that will be strike one. Three strikes and he’s out to vegas… Hutchison is nearly ready, McGowan isn’t expected to miss much time, and there’s a plethora of arms a step behind. AA has been talking up Cecil as if he was talking trade… Wouldn’t be surprised to see that before he crashes and burns his way to Las Vegas.